O God, who are rich in mercy and who willed that the blessed John Paul the Second should preside as Pope over your universal Church, grant, we pray, that instructed by his teaching, we may open our hearts to the saving grace of Christ, the sole Redeemer of mankind. Who lives and reigns with you in the unity of the Holy Spirit, one God, for ever and ever. The Vatican Congregation for Divine Worship has approved the insertion of the optional memorial of St. John Paul II in the proper calendar of the dioceses of the United States for today. Karol Jozef Wojtyla was born in 1920 in Wadowice, Poland. After his ordination to the priesthood and theological studies in Rome, he returned to his homeland and resumed various pastoral and academic tasks. He became first auxiliary bishop and, in 1964, Archbishop of Krakow and took part in the Second Vatican Council. On 16 October 1978 he was elected pope and took the name John Paul II. His exceptional apostolic zeal, particularly for families, young people and the sick, led him to numerous pastoral visits throughout the world. Among the many fruits which he has left as a heritage to the Church are above all his rich Magisterium and the promulgation of the Catechism of the Catholic Church as well as the Code of Canon Law for the Latin Church and for the Eastern Churches. 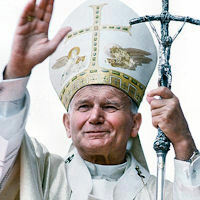 In Rome on 2 April 2005, the eve of the Second Sunday of Easter (or of Divine Mercy), he departed peacefully in the Lord. Historically today is the feast of St. Mary Salome, the mother of James the Greater and John the Evangelist, the "sons of Zebedee." She was among the women who stayed by while Jesus was on the cross, according to Gospels she is among the women who discovered the empty tomb. In 1948, Father Wojtyla returned to Poland and was appointed a curate in the parish church of Niegowi?, near Krakow, and later at Saint Florian in the city. He was a university chaplain until 1951, when he again undertook studies in philosophy and theology. In 1953, Father Wojtyla presented a dissertation at the Jagellonian University of Krakow on the possibility of grounding a Christian ethic on the ethical system developed by Max Scheler. Later he became professor of moral theology and ethics in the major seminary of Krakow and in the theology faculty of Lublin. On 4 July 1958, Pope Pius XII appointed Father Wojtyla auxiliary bishop of Krakow, with the titular see of Ombi. Archbishop Eugeniusz Baziak ordained him in Wawel Cathedral (Krakow) on 28 September 1958. On 13 January 1964, Pope Paul VI appointed Bishop Wojtyla as Archbishop of Krakow and subsequently, on 26 June 1967, created him a Cardinal. Bishop Wojtyla took part in the Second Vatican Council (1962- 1965) and made a significant contribution to the drafting of the Constitution Gaudium et Spes. He also took part in the five assemblies of the Synod of Bishops prior to the start of his Pontificate. On 13 May 1981, an attempt was made on Pope John Paul II's life in Saint Peter's Square. Saved by the maternal hand of the Mother of God, following a lengthy stay in the hospital, he forgave the attempted assassin and, aware of having received a great gift, intensified his pastoral commitments with heroic generosity. 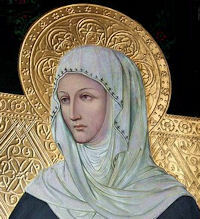 Saint Mary Salome was the wife of Zebedee and the mother of the apostles John and James the Greater. Known as the "Sons of Thunder", these two great men were among the first to be chosen by Jesus to follow Him. Mary Salome, their mother, would be one of the "three Marys" to follow Jesus and minister to Him and His disciples. Thought to be the financial source for their travels, Mary Salome, along with Mary Magdalene and others, would give all they had to further the works of Jesus and His followers. Mary Salome was a witness to the crucifixion, entombment and was mentioned by St Mark as one of the women who went to anoint the Lord's body, finding Him to be resurrected. In the Gospel, Mary Salome asks what place her sons will have in the Kingdom. Jesus tells her that it is the Father who decides and that they will have to follow His example and earn their place in paradise. Legend says that after Pentecost, Mary Salome would travel to Veroli, Italy where she would preach the Gospel for the rest of her life. She would become the patron saint of this historic city. Many women of this day and age can relate to a women of such faith as Mary Salome. She watched her sons drop what they were doing, leave the family business and follow a man they knew little about. At first, this must have been frightening. But, just as many mothers have watched their sons leave, maybe to go off to war, great faith carried her through and even led her to take up the same cause as her sons. May we all have the faith and love of Mary Salome. This Wednesday, October 22nd, we celebrate the feast day of St Mary Salome, mother of the apostles John and James.